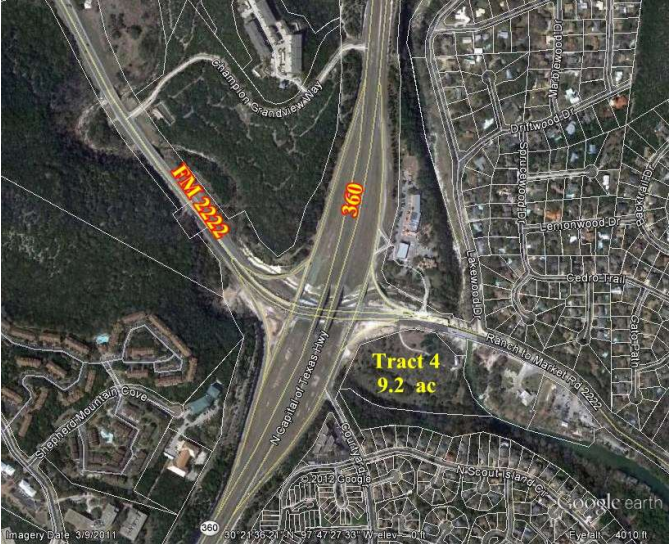 Champions Tract 4 is a roughly 9 acre plot located on the southeast corner of 360 and 2222. The property is divided with 8 acres zoned GR and 1 zoned RR. The property is subject to the entitlements outlined in the 1996 Compromise Settlement Agreement between the City of Austin and the Champion Family. In 2005, Site Plan A for a 2 story retail development was granted but no development occurred. In July 2017 Site Plan B for a 5 story hotel with 220 units, 285 parking spaces and restaurant was submitted. Aug 2017 – City of Austin determines that Site Plan B (hotel) is too different from Site Plan A (retail) and in order to retain entitlements granted by the 1996 Settlement Agreement, Part A must be revised and stay active. Oct 2017 – Applicant applies for extension of Part A. The approval of a third extension of the site plan allows entitlements from 1996 to be carried forward well over 20 years. Over that time, development codes have evolved significantly to reflect lessons-learned regarding harmful impacts to water supply, erosion and public safety. Repeated extensions result in further deviations from present-day responsible development. Upcoming Dates 11/26/2018 – Deadline for ZAP to make a ruling regarding the application for extension.